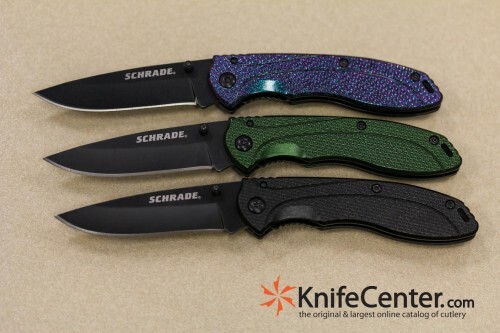 You can not beat the price and the functionality behind these Schrade Utility Liner Lock Folders. These knives are lightweight but strong enough to get the job done. They’re excellent designs and there is sure to be a model that catches your eye and fits your needs well. Give them a try, you will not be disappointed – excellent quality for the price. See them all at www.knifecenter.com. A cold front blew in from the West the other day, leaving us with sunny skies and-oh look, the awesome new Kershaw Brawlers! These are a whole lot of knife for the money. 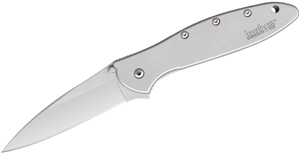 They offer Kershaw’s smooth SpeedSafe® assisted opening, accessed via the thumb studs or the built-in flipper. 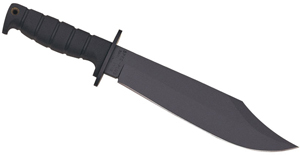 A nice, solid liner lock secures the tanto-style 3 1/4″ blade, featuring 8CR13MOV stainless steel with a non-reflective black DLC coating, available in both plain and partial-serrated edges. Grab one today before somebody else beats you to the punch! Check them out at www.knifecenter.com! All of the brands we carry make top notch knives. The custom and limited edition products we carry are some of the highest quality knives on the market. But only Benchmade’s Gold Class series takes those excellently designed knives and advances them to the next level with extravagant and rare materials. From the hornet’s-nest damascus blade to the anodized gold titanium liners, the Gold Class 690-101 is a piece of art. Take note: The Benchmade Gold Class 690-101 is one of the most expensive folding knives we carry. But it is also one of the most beautiful and unique knives we have had the pleasure of offering to the public. The blade of the Gold Class 690-101 is made out of a complex damascus. It is like a Rorschach test, with each examination revealing new insight. The mammoth ivory used for the handles is very rare, coming primarily from mammoths preserved in the Russian tundra. The bolsters are made of mokume, a Japanese style of metal very similar to damascus, but made with gold and other rare metals. The collector who is looking for the prestige of a well made, rare, and valuable knife need look no further. This is the pinnacle of the art form. Boker has come up with another very cool knife. A variation on the karambit or hook blade, this liner locking folder has 4 distinct curves in the edge. The effect is like a bat wing- hence the name Batman Knife. This is a great folder. Made in China, but they seem really well made. They both fly open with minimal effort and the large one has an extension of the base of the blade that acts as a flipper of sorts. They have thin G10 handles wirth a titanium liner on the locking side. 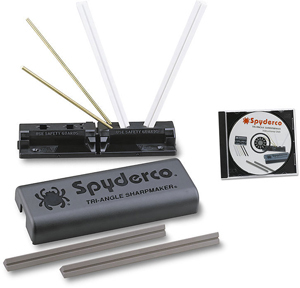 The large model has a smooth handle and the blade is wide and almost fully hollow ground- a really useful configuration.